In 1978, John Carpenter and Debra Hill took a bare bones budget and crafted a masterpiece called Halloween. In 1980, the world found out what Carpenter could do with a real budget at his disposal. The Fog 1980 is one of the best horror movies to emerge from the golden era that was the late 1970s and early 1980s. Carpenter and Hill brought back a few stars from Halloween, including Jamie Lee Curtis and Nancy Kyes, and augmented the cast with talented heavy hitters, such as Janet Leigh, Adrienne Barbeau, Tom Atkins, James Canning, Charles Cyphers, and Hal Holbrook. Together, these talented actors and storytellers tell the tale of mariners betrayed by a town. Meet Antonio Bay, a small California coastal town, which could just as easily be located in New England, North Carolina, or along any slice of United States coastline. And maybe that is part The Fog’s allure – that you can easily imagine the locale as Cape Cod or any other coastal location. The opening of The Fog 1980 is one of the most brilliant in horror history. The story begins with the late John Houseman spinning a yarn about betrayal and shipwrecks to terrified young people seated around a campfire. Never before nor since has the stage been so well set for what was to come in a horror movie. The tale alone is worth the price of admission. Antonio Bay has a dastardly past that is chronicled inside a diary hidden within a church’s walls. Shortly after the diary is rediscovered, the wronged come back to enact their revenge, coming and going with a ghostly fog. The Fog is well-acted and brilliantly directed. Carpenter and Hill kept the plot tight, and before long you will find yourself empathizing with, as well as fearing the monsters coming out of the fog. The fog effects are excellent, making the fog’s march down the streets of Antonio Bay look terrifyingly believable. To heck with the CGI effects from the remake. The fog bank in The Fog (1980) looks real and takes on a life force of its own. The musical score is simple and effective, much as was the score for Halloween, setting a brooding tone without getting in the way. Carpenter is the horror set piece and scene master. In Halloween, Carpenter brought us some of the most memorable moments in horror history (think of P.J. Soles’ character, Lynda, looking up at her boyfriend, Bob, wearing a ghost sheet over his head. Only that isn’t really Bob…). Carpenter does not disappoint in The Fog. Much of the terror plays out in front of Stevie Wayne (Barbeau), a late night disc jockey with a God’s-eye view of Antonio Bay’s coastal borders. The “Dan the Weather Man” scene is unforgettable. Particularly gripping is the elderly babysitter answering the knocks upon the door, as Wayne’s young son sheepishly watches from within the house. Wayne can see the horror spreading before her eyes, but she is helpless to do anything other than shout warnings to anyone who might be listening. The final “chase” between the ghostly fog and the fleeing residents of Antonio Bay is heart-pounding suspense at its finest. 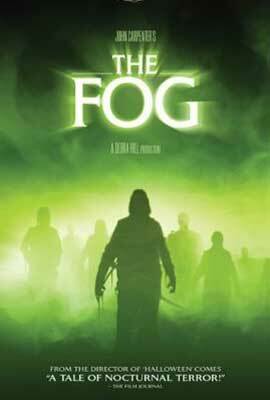 If your only knowledge of The Fog is of its terrible 2005 remake, run, do not walk, to order a copy of the 1980 original. There is no comparison between the two movies. The Blu-ray collector’s edition of The Fog 1980 is available on Amazon.